For modern and chic brides looking for inspiring traditional bridal lehenga choli designs with a dash of contemporary, Anju Modi offers her luxury couture to indulge in. This 25 year old brand is deeply inspired by India's multi-hued culture and rich heritage. If you loved the look of every girl’s style icon Deepika Padukone as Leela in the movie Ram-Leela or Mastani in Bajirao Mastani, the credit goes to this ace designer pours extensive research into every lehenga choli design or traditional Indian outfit she crafts with perfection, truely making it a labour of love. In her bridal lehenga choli designs you will find Chanderi weaving, Kota fabrics, Varanasi Zari work and Bandhani printing playing a key role. Each of her ensembles is a reflection of our rich cultural history and is a beautiful tribute to modern feminism. 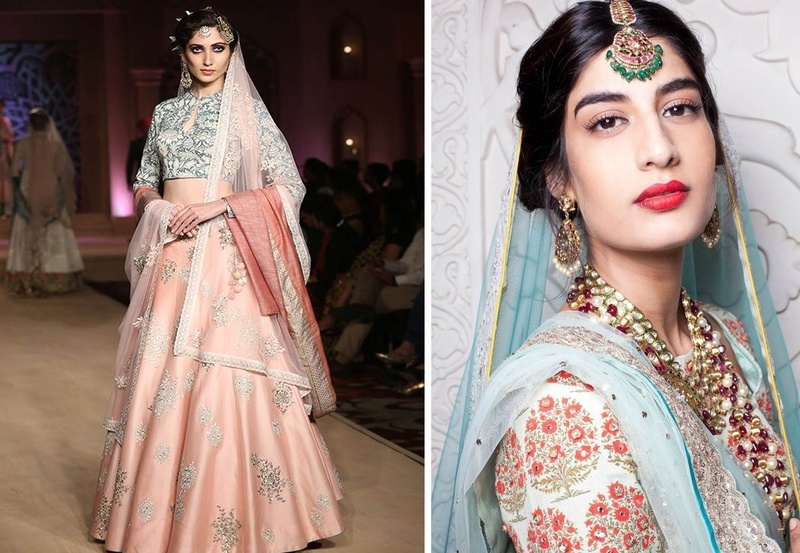 To make the task of picking from her vast collections all the more easier, we’ve highlighted some of her brilliant and exquisite bridal lehengas that have stunned us till date. Either of these can be a great choice for your pre-wedding festivities or wedding reception. This beautiful set features prolific wool and zari patterns on an indigo dupion silk skirt, paired with an intricately embroidered net blouse and a powder blue tussar georgette dupatta adorned with ivory woolen work. Embellished with antique zari and dabka work, this old rose style is crafted in dupion silk. Paired with a hand embroidered full-sleeved blouse and a gold tussar georgette drape. The angrakha style golden blouse is finished with blush-red embellishments and gold chanderi prints. Skirt is tailored in a pleated olive silk with hand-embroidered patterning with antique zari. This vivacious bridal lehenga byAnju Modi is crafted in blush chanderi silk. The skirt is meticulously detailed with embroidered resham and dabka. The printed blouse is tailored in khadi and features a keyhole cut-out. A pink net embroidered dupatta and a printed old rose tussar drape completes the look. Intricately embellished in wool and antique zari, this jacket-blouse is constructed in dark indigo dupion silk and is elegantly embellished. The shimmering lehenga in dupion red adds drama to the look. A decorated net dupatta completes the attire. Bold indigo blouse in dupion silk is hand-embellished in floral patterns of wool, antique zari and dabka balanced with a delicate, floor length silk skirt, embroidered and finished with a blush mokaish net overlay. A net dupatta crafted in gold mokaish adds excitement to the look. Kangana Ranaut flaunts her stunning supermodel frame in this immaculately crafted set. The fitted crop-top blouse is customized in indigo dupion, heavily embellished with wool, antique zari and dabka embroidery, paired with a matching pleated silk skirt. The dramatic ensemble features a dark indigo blouse customized and embroidered in a textured khadi base. The skirt is constructed in pleated dupion silk and is adorned with intricate wool, zari and dabka embroidery. Crafted from a hand-embellished Indigo dupion base, the crop-top styled blouse gives a contemporary twist to the traditional silhouette. The layered velvet red skirt is intricately decorated with wool embroidered patterns and highlighted in antique zari and dabka. An embroidered mokaish net dupatta completes the ensemble. An ivory angrakha style khadi blouse embellished in wool and zari, paired with a velvet embroidered skirt in dark indigo with a mokaish net dupatta finished with hand embroidered zari and dabka detailing.